I was complaining a while ago that we no longer receive real hidden object games as the focus of the developers is on the adventure part. Which is an important part, I agree, but sometimes I feel the need of testing my eyes in hidden object scene after scene and not care too much about collecting items and completing an adventure. 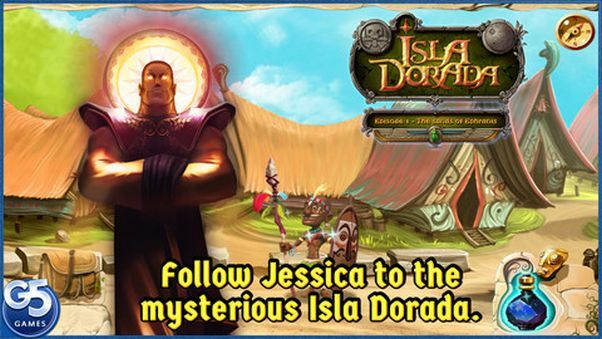 And now I have Isla Dorada – Episode 1: The Sands of Ephranis just released for iPhone, ready to fulfill my wish. The game starts extremely nice, telling us the story of the beautiful main character, Jessica Pandora, a young archaeologist who discovers an important artifact that teleports her into a new world. Of course, she wants to get back home and enjoy the success of her discovery, and it will be your job to help her solve the mystery of the strange world she is lost in and get back home. 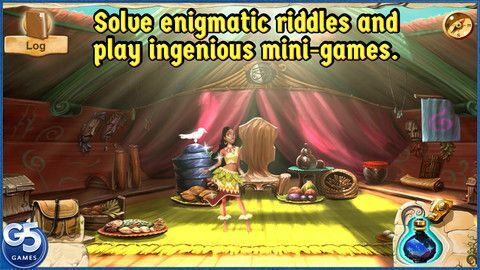 You will do so by mixing the classic adventure mechanics (travel from area to area, collect items and solve mini games) with the hidden object scenes. Fortunately – at least for those like me – the hidden object game scenes are the main focus here and you’ll get them aplenty. Unfortunately, they are not always the best scenes you have ever played, being sometimes too difficult (in terms of objects to spot) or too easy to beat. But at least you’ll have a ton of HO scenes, and that should be enough to keep you happy. The game’s biggest problem is the story and how it unfolds. Everything begins so nice and makes you curious, but the development lacks creativity and the story is dull and uninteresting. It is more of something you have to go through to get to your next hidden object scene and even though the developers have tried to boost it with full voice overs, they still didn’t manage to keep me interested. But I was here for the hidden object scenes anyway! Apart from the hidden objects, we do have a set of 25 achievements to unlock, many of them based on our performance in the hidden object scenes, as well as an interesting gameplay mechanic involving a statue that has to be dragged around to reveal scenes we have to play. I don’t really see the reason for this, but it doesn’t really hurt the game. Visually, except from the heroine of the game, there’s not too much eye candy. You can feel that the original game was launched back in 2011 and the graphics are a bit outdated and unspectacular. The voice over is also one of mediocre quality which, combined with the dull story, doesn’t bring much value to the game either. All in all, Isla Dorada – Episode 1: The Sands of Ephranis is not the best game out there, but if you are like me and you want to focus on the hidden object scenes and not on the “adventure” then you should definitely give it a try because it’s mostly about the hidden objects. Don’t expect to be blown away though as there’s nothing spectacular here. Except from the main character. I think I have a crush!